Criticism at work starts early, at entry level when you’re focused on the boss’s scathing comments. You console yourself, anticipating your turn to dish out the criticism when you become the manager. But leaders get criticized from above, below, and from everywhere else. The difference is high visibility that requires a calm appearance in the face of the most negative feedback. 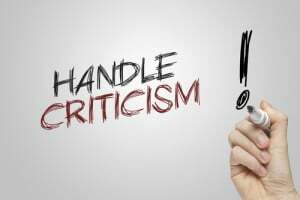 So, when you are in a leadership position and you begin to feel the arrows of criticism flying around you, below are a few ideas that you can use when you are under fire. Here’s how an effective leader deals with criticism. How Do You Demonstrate an Effective Leader’s Grace Under Fire? Listen intuitively. Separate valid points from empty rants. Criticism carries truth but often comes with unrelated variables. Was the person reprimanded by his boss, stuck in hour-long traffic, worrying about his kids, or nursing a hangover? Turning analytical is a double win. It cools emotions, avoiding a regrettable knee-jerk display. It zeros in on the issue, clearing the way to a solution. Step back and, as Brock Hansen writes in Shame and Anger: The Criticism Connection, detach from those two emotions and summon curiosity to get the facts. International hotel general managers are used to getting criticism from head office, the owning company, employees, industry peers, and the press. But guest comments get top priority. These are promptly addressed and expeditiously resolved, so the guest departs happy. Masters of grace under fire, front-of-the-house section heads routinely listen to irate guests scream at them because of mistakes from other departments. Only when the rant is done do they speak up to verify the issue and offer a solution. A non-response can turn into the main issue, overshadowing the simpler problem. Handled promptly and professionally, complaints are great opportunities to gain loyal guests who spread the good word. Was it a flaw in the procedure or a failure in standards? Was it a decision making error? An effective leader owns up to her mistakes and takes responsibility over her team’s shortcomings. She understands that accountability is a prerequisite to finding a solution, but she doesn’t recklessly bawl out her team. She apologizes when called for but always implements changes, utilizing the criticism as a teaching tool on accountability and as a training point on standards and procedures. Make personal changes and rally your team so you don’t apologize for the same mistake. What if the criticism against you and your team is undeserved? Here’s a third win for not taking criticism emotionally. When you clarify objectively, point by point and preferably in writing, how you and your team are not accountable for the issues raised, it will be better received. Your critic will accept your clarification openly or grudgingly. Either way, he’ll think twice about criticizing you again. You’ll boost team morale, gain trust, and earn respect in the process. Support your people and set the record straight. Getting loads is the measure of a bold, dynamic leader who makes relevant, innovative decisions that challenge the status quo. It shows you’re not just taking the path of least resistance. And others are taking notice. So the next time you’re under fire, welcome the heat with good humor and follow what effective leaders DON’T do. Don’t take yourself too seriously.